I am a frequent media commentator on a range of issues including uses of social media, online communication, birth and early childhood online (including ‘sharenting’), digital death privacy, Instagram, Facebook, Twitter, and related topics. Below (with links where possible) are a range of publications and broadcasts for which I’ve been interviewed. I am also an occasional contributor to The Conversation; you can find my writing there via my Conversation profile. If you’re a journalist seeking comment, the most effective way to contact me is a direct message on Twitter, or via my Curtin email address, t [dot] leaver [at] curtin [dot] edu [dot] au. Interviewed in Rhianna Mitchell, #MeToxis Razor Ad: Gillette cuts through with challenge on masculinity, The West Australian, 17 January 2019, p. 10. Interviewed in Luke Costin (AAP), Users like Facebook despite privacy issues,The Australian, 17 September 2018, https://www.theaustralian.com.au/news/latest-news/users-like-facebook-despite-privacy-issues/news-story/0eab731bc39ed2004e11e70245656c54. Interviewed in Ariel Bogle, Twitter users are about to lose followers. Here’s why, ABC News, 12 July 2018, http://www.abc.net.au/news/science/2018-07-12/twitter-followers-to-drop-after-deleting-locked-accounts/9971476/. Interviewed in Shane Wright, ‘Extraordinary blunder’ as bank records vanish, The West Australian, 4 May 2018, p. 4. Interviewed in Craig Hamilton & Liz Clarkson, Facebook Data, Breakfast, ABC Newcastle, 27 April 2018, 6.19am [Radio]. Interviewed in Beware apps turning kids into market data, Courier Mail, Brisbane, 12 September 2017, p. 9. Interviewed in Brigid O’Connell, Kids in data danger: parents ‘oversharenting’, Herald Sun, Melbourne, 12 September 2017, p. 11. Interviewed in Phoebe Wearne, Active on the net, The West Australian, 6 April 2017, p. 13. Interviewed in Robyn Ironside, Exclusive tweet to millions, Adelaide Advertiser, Adelaide, 4 May 2015, p. 8. Interviewed in Robyn Ironside, Twitter announcement is keeping royals relevant, Daily Telegraph, Sydney, 4 May 2015, p. 28. Interviewed in Stephen Stockwell, Facebook Friends, Brisbane Breakfast, 612 ABC Brisbane, 7.40am, 4 December 2014 [Radio]. Interviewed by Adam Shirley, Regarding Online Footprints and Deleting Your Past, ABC 666 Canberra, Drive, 29 Sep 2014, 4:08pm [Radio]. 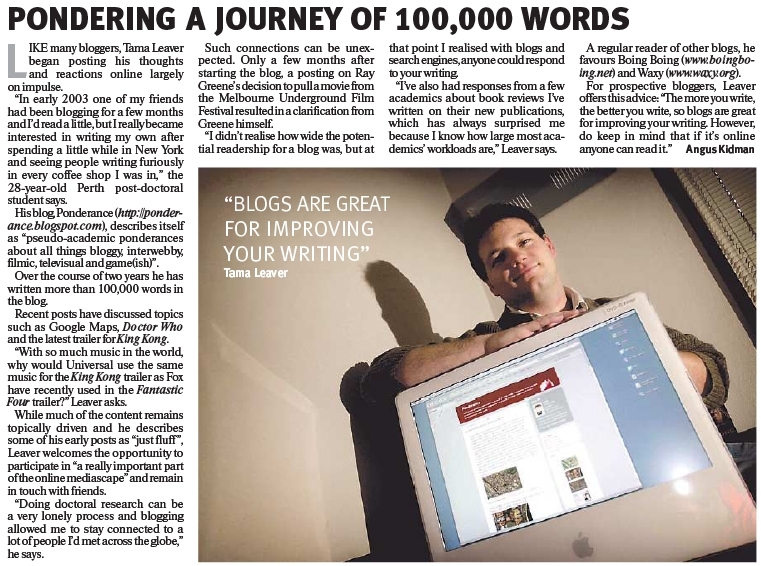 Interviewed in Jenna Clarke, ‘Lara and Sam hit delete’, Sydney Morning Herald, 27 September 2014, p. 24. Interviewed by Daniel Cleary, ‘Ten Years of Facebook’, Morning Magazine, RTR FM 92.1, 10.10am, 5 February 2014 [Radio]. Interviewed in Bethany Hiatt, ‘Net a ‘drain’ on young brains’, The West Australian, 21 January 2014, p. 10. Interviewed for Katie Robertson, ‘Warning on new apps’, Sunday Tasmanian, 6 January 2013, p. 13. Interviewed for Katie Robertson, ‘More than fireworks for cracker year’, Sunday Times, 30 December 2012, p. 22. 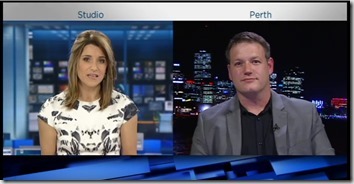 Interviewed for Lindsay McPhee, “Social media sustains young”, The West Australian, 22 March 2012,http://au.news.yahoo.com/thewest/a/-/news/13234095/social-media-sustains-young/. Interviewed for Sheryl-Lee Kerr, ‘”Nail in the coffin” for Blackberry maker.’ The Sunday Times. 22 October 2011, http://www.perthnow.com.au/news/western-australia/nail-in-the-coffin-for-blackberry-maker/story-e6frg13u-1226173833802. Interviewed for Anthony Deceglie, ‘Windows Touch-Up’, The Sunday Times, 18 September 2011, p. 30. Interviewed for Andrew Tillett, ‘MPs turn to tweet power to woo voters’, The West Australian, 16 June 2010, p, 32. Interviewed for David Gear, ‘Teach kids e-stranger danger’, Wanneroo Times, 1 June 2010, p. 7. Invited panellist discussing the ‘The Changing Landscape of News and Journalism’, at the ‘The Future of Journalism: Blueprint for Progress’ event organised by the Walkley Foundation and Media Alliance, held at the ABC East Perth Centre, Friday 21 August 2009. Invited presentation: ‘Web 2.0 and Participatory Culture’ at the CGC (Commercial Games Conference): Multiplayer & Communities, part of GO3 Electronic & Entertainment Expo 2008, Perth Convention Centre, August 2008. Invited presentation: ‘CC for Higher Education’ at Building an Australasian Commons (Creative Commons Australia) Conference, Brisbane, June 2008. Invited presentation: ‘MySpace is better than Yours: Promoting your arts on the internet’ for the PropelArts Forum, PropelArts –Youth Arts WA, August 2007. Interviewed for: Ho, Evana. 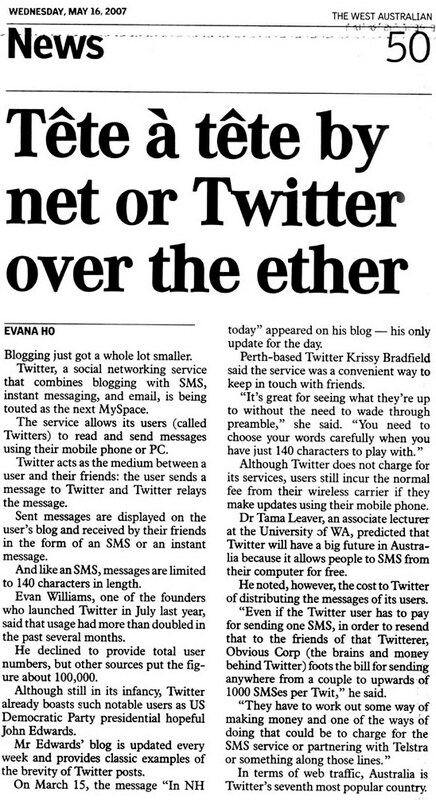 ‘Tête à tête by net or Twitter over the ether’, The West Australian, 16 May 2007, p. 50. (Scanned image of article here:http://farm1.static.flickr.com/189/501699745_b7c0a15b11_o.jpg). Interviewed for: Schaer, Cathrin, ‘A Life Less Ordinary,’ Vogue Australia, May 2007, pp. 198-201. Interviewed for: Waters, Sue, ‘Using Social Software with Students’ and ‘How Universities are using Lectopia to podcast lectures’, Mobile Technology in TAFE Podcast, March 2007,aquaculturepda.podomat… and aquaculturepda.podomat…. Seminar entitled ‘Podcasting 101′ delivered for staff at the Film and Television Institute of Western Australia on Thursday, 12th October, 2006. Invited panel discussion on “Understanding Cross Platform and New Media” at the Film and Television Institute of Western Australia on Thursday, 30th March 2006. Profiled in: Kidman, Angus, “Pondering a Journey of 100,000 Words”, The Australian, “IT Alive” Liftout, 12 July 2005, p. 5, (Scanned image of the article here:http://photos22.flickr.com/25386949_8658763197_o.jpg). Interviewed for: McConnachie, Dahna. “Blogging at the end of the earth”, PC World, 14, October 2004,http://www.pcworld.idg.com.au/index.php/id;715547121;fp;2;fpid;1, simultaneously cross-published in ComputerWorld: The Voice of IT Management and LinuxWorld.Com.Au. Invited public talk on ‘Blogging Universities’ delivered at BlogNite: Blogging at the end of the Earth, Curtin University, 27 October 2004.